This month saw us visit South Farm (just around the corner, quite literally) three times. Our first couple were Anna and Rob, who brought a whole lot of countryside charm to this sunny day. The day started relaxed with us popping in to see the bride getting ready. Then we made our way to the house for the ceremony among Anna and Rob’s nearest and dearest. Once vows were said and knots were tied we headed for a wander around the farm with the new Mr and Mrs, Anna sporting a pair of bright orange wellies for our jaunt. Good news, there were piglets! Staying on the wellies theme, it was then time for some welly wanging. Yes, you heard us right, an old West Country tradition of slinging wellies, the winner is whoever wangs them the furthest! After a gorgeous reception and plenty of bubbles, it was time to get that party started! A wonderful start to our South Farm trio. Anna + Rob – South Farm from LinaandTom.com on Vimeo. 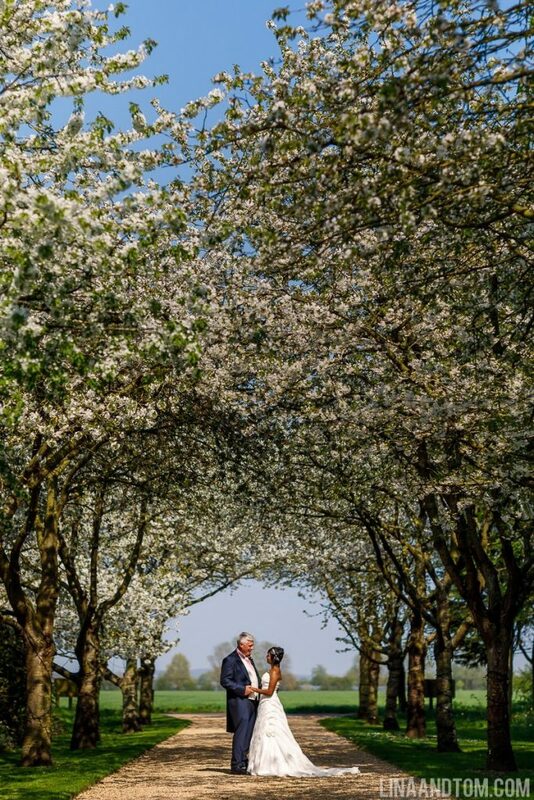 By the time we headed back to South Farm for our second wedding, spring had burst into bloom. The warmer weather meant our couple had a beautiful outdoor ceremony in the gardens, followed by a chilled stroll around the farm for more piglet (and chicken and newborn lamb) cuddles. The reception featured the most delicious roast pork dinner, carved by the groom himself and some specially selected guests in a fetching comedy aprons. Dotted around the room were some lovely decorative touches like mini Colin the Caterpillar cakes as wedding favours (super cute and great on a budget). The wedding cake was also accompanied by a mini cake, topped with miniature figures of the family pooches. The party started with a wonderful first dance in the beautiful old barn and ended with all the guests on the dancefloor. What a joyful day! Sarah + Phil – South Farm from LinaandTom.com on Vimeo. The venue may be the same, but every single wedding at South Farm is different. To complete the hat trick we photographed Jerry and Rose’s cricket-themed day – the bride is an ex-international for Sri Lanka and the two of them met on the cricket ground. Naturally, there was a cricket-themed cake, accompanied by a backdrop of the Sri Lankan flag. The barn was packed to the rafters for Jerry and Rose’s wonderful ceremony, followed by a lively reception afterwards. The farm was very much still in the throes of spring, so we headed out for photos under the blooms one more time. A day of smiles and fun – congratulations Rose and Jerry! Rose + Jerry – South Farm from LinaandTom.com on Vimeo. Then it was time for a brand new venue, with our first visit to the Crondon Park wedding venue in Essex for Sarah and Rich’s day. Their big day started with guests making an entrance on an old-fashioned London red bus, complete with ribbons. The ceremony was held in a nearby church before everyone headed off for a sumptuous wedding breakfast at Crondon Park’s Jacobean barn. Their magnificent oak-beamed barn is a wonderful space, and it looks utterly gorgeous all dressed up too. Our couple had added some sweet personal touches too, including pictures of them as young uns on each table. After a few drinks we headed off with our couple to explore the grounds, the weather was fantastic so we had no trouble taking some gorgeous photos outside. We returned later for an incredible sunset, and then again for some dramatic night portraits. We love this venue, it has everything! The 15th-century barn makes such a dramatic setting for a reception, and the self-contained grounds are perfect for couples portraits. No one photobombing you here! Sarah + Rich – Crondon Park from LinaandTom.com on Vimeo. 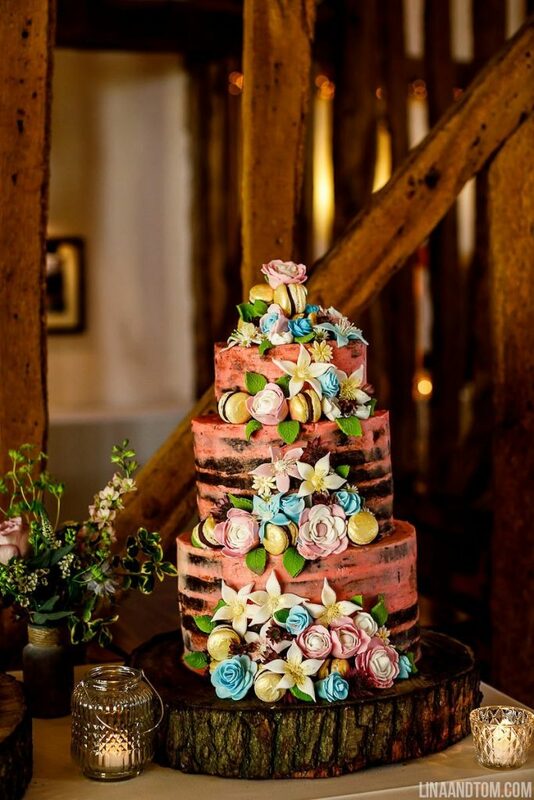 We hope we’ve given you some fab spring wedding inspiration, for more ideas don’t forget to follow our Pinterest board. Want to check we’re free on your wedding date? Get in touch!